Damen Shiprepair Rotterdam (DSR) completed 2 ½ years of refurbishment work on FPSO Petrojarl 1, delivering it back to the owners Teekay Offshore on the 18th of August 2017. Following this work the vessel will be redeployed at the Atlanta field in Brazil. Petrojarl 1 arrived at Damen Shiprepair Rotterdam in January 2015 and after four months of preliminary work alongside, moved on April 16, 2015 into dry dock No. 8 (307m long x 47 m wide) for work to the hull. DSR was awarded an Engineering, Procurement, and Construction (EPC) contract by Teekay Petrojarl LLC for the modification and upgrade of the Petrojarl 1 FPSO. DSR contracted Nevesbu to undertake the naval architecture and marine engineering and design work, Iv-Oil & Gas for the process facilities engineering, procurement and commissioning within the Nevesbu scope. A third engineering partner, Frames Process Systems (FPS), was also contracted for the project to design and fabrication of the new topside skids. The project consists of the basic, detailed, construction and interface engineering, refurbishment of its marine systems, underwater hull, seawater system, crane booms, heating coils in the cargo tanks and specialised steelworks in the upper and lower turret areas, which needed to be completely revised and adapted to suit the 1500 metre deep mooring location, performance testing and commissioning activities. It also includes conversion of the process systems (i.e. separation train and produced water topsides) and new designed and prefabricated equipment skids containing heating, cooling, separation, compression, boilers, centrifuges as well as a new E-house with electrical equipment were placed on board. Interconnecting piping and cabling was subsequently installed to complete the topsides and connect it to the existing facilities. The Petrojarl 1 is a Norwegian-flagged vessel, with DNV classification DNV+AI mobile offshore unit. It was designed by Golar Nor and features an internal turret secured by eight anchor legs. It was originally built in 1986 at Nippon Kokan Kabushiki Kaisha (NKK) Tsurumi shipyard, Yokohama, as a well test and production ship. 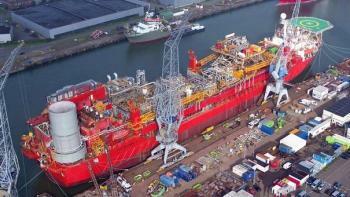 Later on it was refurbished to become a floating production, storage and offloading (FPSO) unit. It has since been used on various fields in the British and Norwegian sector of the North Sea; including: Oseberg, Troll, Lyell, Fulmar, Balder, Fife, Fergus, Flora and Angus oil fields, Hudson, Blenheim and Kyle oil field. Petrojarl 1 most successfully deployed including 12 years on Statoil’s Glitne field, which finished in May 2013. In December 2014, Teekay Offshore reached an agreement with a consortium led by Queiroz Galvão Exploração e Produção SA (QGEP) to provide an FPSO unit for the heavy crude oil Atlanta field, located in the Santos Basin, 300 kilometres off the coast of São Paulo, Brazil. It is estimated that the field contains approximately 190 million recoverable barrels and has a production life in excess of 15 years.